Six samples arrived recently from Desert Hills Estate Winery near Oliver, a solid producer whose wine are always anticipated. It was only when I had tasted the wines and started organizing my notes that I discovered I had tasted and rated four of these in a blog last fall. So I referred back to that blog to see if I had scored the wines any differently. Either the wines are consistent or I am consistent, but my scores were identical. Below, I repeat those four wines. The two samples not reviewed before are marked with a star. Something else is new at Desert Hills: Anthony Buchanan, who had been the winemaker at EauVivre Winery in the Similkameen, has taken over from George Phiniotis, whose career was sidelined by an accident last year. He should certainly have those opportunities in spades at Desert Hills. Proprietors Randy and Jessie Toor farm about 70 acres of prime vineyard on the Black Sage Bench. The wines are produced in a recently expanded winery, significantly larger than it was when Desert Hills opened in 2003. Here are notes on those six wines. Desert Hills Gewurztraminer 2014 ($22.90 for 1,300 cases). This wine has strong varietal definition, with aromas of ginger and orange marmalade. On the palate, the fruit flavours are intense, with spice and lychee. The texture is lush and the finish is quite persistent. The wine is balanced to finish dry. 90. Desert Hills Viognier 2014 ($24.90 for 650 cases). The wine begins with appealing aromas of apricot and cantaloupe. The palate has intense fruit flavours that include honeydew melons, citrus and apples. The finish is crisp and refreshing. Fermenting this wine cool, at 15C, preserved the fruitiness. 90. Desert Hills Gamay 2014 ($19.90 for 2,600 cases). Few wineries in the Okanagan have such a major commitment to Gamay Noir. Usually regarded as the junior partner to Pinot Noir, it produces some very drinkable wines. This is a bold, juicy red with aromas of black cherries. On the palate, there are ripe, spicy flavours of cherry and mocha. The finish lingers. 91. Desert Hills Syrah 2011 * ($36.90 for 904 cases). Dark in colour, this wine begins with earthy, spicy and meaty aromas. On the palate, there are flavours of figs, plums, black olives and espresso coffee with a hint of black pepper on the finish. 90-91. Desert Hills Cabernet Sauvignon Reserve 2012 ($29.90 for 500 cases). Dark in colour, the wine begins with aromas of cassis, cherry and vanilla. On the palate, there are flavours of black currant with hints of leather and tobacco. The wine, which was aged 14 months in French oak, has disciplined age-worthy tannins. Decant this for current drinking. 90. Desert Hills Mirage 2011 * ($36.90 for 450 cases). This is a blend of 40% Cabernet Sauvignon, 30% Merlot, 15% Malbec, 10% Cabernet Franc and 5% Petit Verdot. The individual wines are aged 18 months in French oak before being blended. The result is and elegant and complex wine with aromas of black cherry, vanilla and chocolate with a slight suggestion of bell pepper. On the palate, there are flavours of black cherry and other vibrant red fruit, along with vanilla, chocolate, black coffee and licorice. The tannins are polished and the finish is long. 92. For Riesling lovers, the good news is that Tantalus Vineyard has just announced the release of both its 2013 Old Vines Riesling and its 2015 “regular” Riesling. They are among a spring release of almost the entire portfolio from this East Kelowna producer. Other wines include two sparkling wines, two Pinot Noirs and a rosé. · Tantalus is arguably the leading producer of Riesling in the Okanagan (although a rising number of other wineries are hot on this winery’s tail). · Tantalus Riesling wines can be recommended for purchase by anyone with the patience and the cellar to lay down these wines for a future vertical tasting. In mid-February, Tantalus owner Eric Savics and David Paterson, his winemaker, hosted a 10-year vertical tasting of Tantalus Riesling wines. It spanned the vintages from 2005 to 2014. Every one of those wines, including the 2005, was alive and full of vibrant flavours and aromas. This was a tasting of the winery’s “regular” Riesling, the one that sells for about $20 a bottle. It was not a tasting of the Old Vines Riesling, a $30 wine. You might be hard-pressed to find another $20 Okanagan white still as lively at 10 years. The point is that this wine rewards you for cellaring it; and buying it does not break the bank. Some definitions are in order. The Tantalus Old Vines Riesling is made from the small block of clone 21-B Riesling that was planted in the vineyard in 1978. There are perhaps just two other blocks of Riesling this old in East Kelowna. The earlier vintages of the regular Tantalus Riesling (2005, 2006 and 2007) were made with Old Vines fruit. 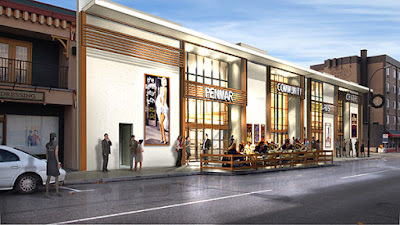 Eric redeveloped other parts of the vineyard after buying the property in 2003. Young Riesling plantings provided some of the fruit in 2008 and have dominated the wine ever since. Both the regular and the Old Vines Riesling wines are dry. The regular usually has a touch more residual sugar, making the wine more accessible when it is young. The Old Vines typically is quite dry with bracing acidity. Old Vines is not released until it is two years old, just to let the acidity settle down. In both of these wines, the acidity is what preserves the fruit and the aromas. When I tasted a 2005 Old Vines Riesling last year, it seemed to me that the wine would live to 2025. The current release, a 2013 Old Vines Riesling, also impresses me as a 20-year wine. At the vertical tasting, every vintage had lively acidity, even a hot vintage like 2009 which produced a slightly softer Riesling. The 2007 and 2008 vintages were preferred by many tasters – but none of the vintages let the side down. This underlines the collectability of these wines. A bottle of Tantalus Riesling so impressed David Paterson – who was then working with a wine retailer in Vancouver – that he sought a job with the winery in the 2008 harvest. When Matt Holmes, the previous winemaker, left, David succeeded him in 2009. David was born in Vancouver but grew up in New Zealand. He graduated in winemaking from Lincoln University in New Zealand and worked several vintages there, in Australia and in Oregon. Before returning to Canada, he was the production winemaker at Henschke Cellars, one of Australia’s leading family-owned wineries. The Rieslings from Tantalus are classic examples of terroir-driven wines. David, now the general manager of Tantalus as well as the winemaker, and Eric share an ambitious goal for the winery. Tantalus Old Vines Riesling Natural Brut 2013 ($34.70 for 150 cases). This is a crisply dry sparkling wine with aromas of lemon and lime and flavours of green apple and grapefruit. 90. Tantalus Traditional Method Blanc de Noir 2013 ($27.74). This wine’s appeal begins with the lovely and delicate pink hue in the glass, along with the lively display of bubbles. The aromas are fruity and the palate offers a rich medley of flavours ranging from apple to red licorice. This is a delicious and festive bubbly. 92. Tantalus Rosé 2015 ($19.04). This is a blend of 60% Pinot Noir, 40% Pinot Meunier. The wine is light and refreshing with a rose petal hue with delicate aromas and flavours of strawberry and cranberry and grapefruit. The finish is crisp and almost austerely dry. 88. Tantalus Old Vines Riesling 2013 ($30.35). The wine has begun to develop the classic petrol aroma of Riesling, along with notes of lime. On the palate, there are flavours of lime and grapefruit around a firm spine of minerality. The wine has good weight and a very long and profound finish. 93. Tantalus Riesling 2015 ($19.91). The wine has intense aromas and flavours of citrus mingled with notes of spice and with lively acidity. 91. The Wildebeest Restaurant at 120 West Hastings in Vancouver has emerged as a funky but effective venue for wine tastings. It seems especially suited to artisanal wineries. The nine producers at this year’s tasting included several scheduled to be at the much larger Garagiste tasting within the week, artisanal meaning much the same thing as garagiste. The Wildebeest is a long, narrow room, which makes for cozy quarters around the tasting tables, all of which usually are arrayed against one wall. However, the people who attend these tastings are, for the most part, sommeliers and restaurant wine buyers, well indoctrinated in tasting room etiquette. In other words, these people do not belly up to a table and stay there, cutting off access to the wines and the principals (unlike the tasting room at the International Wine Festival). There also is a constant ebb and flow of attendees during the three hours allowed for tasting. One can overstay a bit but not much because the restaurant needs to reset the tables for dinner. I did push it a bit but, for once, I touched base at every table. Here are my notes. Prices usually are retail unless – where they end in odd cents- it is the so-called hospitality price, which excludes 15% tax. Anarchist Mountain Vineyard is a tiny producer based on a three-and-a-half-acre vineyard that seems precariously perched on the side of Anarchist Mountain, overlooking Osoyoos. The vineyard was planted in 1985 by Anthony Dekleva. It is now owned by viticulturist Andrew Stone and his partner, Terry Meyer Stone. So far, their well-crafted wines are made by consultants in custom crush wineries. Anarchist Mountain Elevation Chardonnay 2013 ($26). This is a pristine and focussed wine with lovely flavours and aromas of citrus and ripe apples that linger on the finish. Think of Chablis with weight. 90. Anarchist Mountain Wildfire Pinot Noir 2014 ($35 for 70 cases). Andrew is so encouraged by the Pinot Noir on his site that he has replaced two of his three acres of Chardonnay with Pinot Noir. This wine begins with appealing aromas of raspberry and cherry that are echoed on the palate. Chris Carson, the winemaker who crafted this wine, fermented partially with whole clusters. He succeeded in creating a wine with a good backbone of long, ripe tannins. 91. Anarchist Mountain Mayhem Merlot 2013 ($35 for 90 cases). Made by winemaker Mark Simpson with fruit for Anarchist’s 18-year-old Merlot vines, this is a bold and concentrated wine. It has 15% alcohol, balanced with rich flavours of black currant, plum, blueberry and chocolate. 90. Fairview Cellars, named for the nearby mining ghost town, is where viticulturist Bill Eggert planted vines in 1993. His 6 1/2-acre vineyard, on a plateau overlooking the first hole of the Fairview golf course, grows primarily red varieties, with Cabernet Sauvignon accounting for half the area. Bill’s reds are notable for their longevity. At the tasting, he poured a delicious 2008 Cabernet Franc, one of his library releases. Fairview Sauvignon Blanc 2014 ($18.17). This is a Sauvignon Blanc in the Sancerre style, with an herbal aroma and with flavours of lime, lemon and herbs. The finish is tangy. 90. Fairview Sauvignon Blanc 2015 ($18.17). What a vintage difference there is in the juicy and tropical 2015 Sauvignon Blanc. There is a delightful medley of peach and guava on the palate. The rich and generous texture reflects the hot 2015 season. 91. Fairview Gusto Bianco 2014 ($15.05). This off-dry wine – 14 grams of residual sugar – is Sauvignon Blanc with a touch of Semillon. The wine, a crowd pleaser, has flavours of pink grapefruit and nectarine. 88. Fairview Crooked Post Pinot Noir 2013 ($21.19). Crooked Post is the label Bill uses for Pinot Noirs blended with estate fruit and purchased fruit. This is a medium-bodied Pinot Noir with fresh wild strawberry aromas and strawberry flavours. On the palate, the texture is silky. 88. Fairview Eagle Bluff Pinot Noir 2014 ($N/A). The fruit for this wine is all from Bill’s Vaseux Lake vineyard. The wine begins with a dark hue and spicy aromas of plum and strawberry, echoed in the concentrated fruity flavours. The long velvet tannins give the wine good weight. 92. Fairview The Bear Premiere Series 2012 ($34.99). This is a powerful Meritage blend with aromas of cassis and flavours of black currant, plum, black olive and chocolate. The texture is firm. This is a wine to be cellared. 91. Fairview Iconoclast 2010 ($75.09). This wine – which retails for $100 with taxes – is the third vintage of Fairview’s ultra-premium Cabernet Sauvignon. This is an elegant and polished wine, with aromas of cassis and with flavours of mulberry and lingonberry. There is a touch of spice on the lingering finish. 93. Orofino Vineyards was opened in 2005 near Cawston by John and Virginia Weber, former Saskatchewan residents who changed careers in 2001 when they took over a Similkameen Valley vineyard. Initially, they drew attention with Canada’s first winery built with straw bales (a second has just opened near West Kelowna). Now, they are much better known for premium quality wines. Orofino Hendsbee Vineyard Riesling 2014 ($22). The wine has aromas and favours of petrol and lemon with a spine of minerality. The texture is concentrated and the finish is dry. This will develop well with age, as John showed by pouring a library wine, a 2007 Hendsbee Riesling. 90. Orofino Scout Vineyard Riesling 2014 ($22). This wine is finished with a touch of residual sugar, softening the texture. On the nose and palate, there are aromas and flavours of lemon and peach. The fruit lingers on the palate. This is the one I would drink now while cellaring the Hendsbee. 90. Orofino Celentano Vineyard Gamay 2015 ($23). This is a juicy and appealing wine, with gobs of cherry on the nose and the palate and with subtle hint of earth on the finish. 89. Orofino Wild Ferment Syrah 2015 ($29 for 160 cases). Not only was this fermented with wild yeast but – a first for Orofino – it was fermented in a concrete vat. The texture of this wine is soft and rich, with aromas and flavours of plum and black cherry: a youthful fruit bomb. 90. Orofino Red Bridge Red 2013 ($25). This wine is a departure from previous Red Bridge wines, which were all Merlot from a Kaleden vineyard. With this wine, Orofino is completing its focus on just Similkameen fruit. The wine also is a blend: 70% Merlot, 20% Syrah and five percent each of Petit Verdot and Cabernet Franc. It is a delicious wine, with aromas of cassis, flavours of black currant and black cherry and a hint of cedar on the finish. The texture is generous. 92. Orofino Beleza 2012 ($34). This is Orofino’s flagship red, a blend of 40% Merlot, 40% Cabernet Sauvignon, 10% each of Cabernet Franc and Petit Verdot. The wine is a powerhouse of almost port-like fruit that creates a rich, intense mid-palate. It begins with aromas of dark fruits and chocolate, leading to flavours of plum, black cherry and chocolate, with a touch of sage on the finish. 93. Pentâge Winery. which opened near Penticton in 2003, has a remarkable winery in a cave carved from bedrock. The winery is worth the visit just to see this feat of engineering by owner Paul Gardner. The wines are pretty interesting as well. Pentâge Riesling 2012 ($19). Crisp and dry, this has aromas and flavours of petrol, along with flavours of lemon and green apple. 89. Pentâge Sauvignon Blanc Sémillon 2012 ($21). This wine begins with aromas of lemon and gooseberry and delivers flavours of lemon and grapefruit. The wine has good weight, with a finish that is dry and that lingers. 90. Pentâge Rosé 2014 ($17.30). This a rosé of Gamay and Zinfandel grapes. Those raised on off-dry white Zinfandels should note that this is a seriously dry rosé with spicy cherry and plum flavours. 89. Pentâge Gamay 2013 ($21). Here is a lively red for Beaujolais lovers, with aromas and flavours of cherries and red berries. 88. Pentâge Cabernet Franc 2012 ($N/A). Vibrant and brambly, the wine delivers aromas and flavours of blackberry and black cherry. The finish persists. 90. Pentâge Haitus 2012 ($23). This is a blend of 35% Cabernet Franc, 33% Cabernet Sauvignon, 15% Merlot, 6% Tempranillo, 5% Zinfandel, 4% Malbec and 2% Pinot Noir. The wine delivers complexity one usually does not see at this price: layered fruit aromas and flavours of blackberry, black currant, black cherry and spice. 90. SOAHC Estate Wines, a new biodynamic winery in Fruitvale (east of Trail), made its first ever appearance at a Vancouver tasting. (The name is “chaos” spelled backwards.) The vineyard has been planted since 2010 by Jamie Fochuk and his partner, Kim McLaughlin, with guidance in vine choices and winemaking from consultant Alain Sutre. Maturing vines enabled the winery to produce about 900 cases in 2015. Jamie brought along two promising tank samples of Riesling and Chardonnay from 2015. SOAHC Riesling 2014 ($20.49). Tangy and dry on the finish, this wine has already begun to develop the classic petrol (marmalade if you wish) notes on the nose and palate. It has flavours of lime and grapefruit, with good weight. 90. SOAHC Chardonnay 2014 ($20.49). This wine has aromas and flavours of citrus and apple with the buttery notes from partial malolactic fermentation and subtle oak. The finish is crisp and refreshing. 90. Synchromesh Wines, which opened in 2011, has made a name for its well-crafted Riesling wines. Owner Alan Dickinson offered six (!) at this tasting. He seems to have cherry picked some of the best Riesling vineyards on the Naramata Bench to complement his own Okanagan Falls vineyard. Synchromesh Riesling 2015 ($14.69). This is a tangy wine whose bright acidity is modified by a welcome dash of residual sugar. The wine has aromas of lemon and lime, with flavours of lemon and crab apples. 90. Synchromesh Riesling 2015 Drier ($14.78). The wine begins with aromas of lemon with a hint of nectarine, leading to flavours of lemon and lime and petrol. The acidity is bright and, as the label says, the finish is dry. 90. Synchromesh Riesling Thorny Vines Vineyard 2015 ($19.09). This is a vineyard on the southern end of the Naramata Bench, planted with the renowned Clone 21B vines. It begins with aromas of lemon and apple and delivers honeyed flavours of lemon and lime. Vibrant acidity makes for a refreshing finish. 91. Synchromesh Riesling Bob Hancock Vineyard 2015 ($19.09). This 3.5-acre vineyard at the north end of Naramata Bench is planted with self-rooted Clone 21B on gravelly loam. The wine has a fleshy texture and peach aromas and flavours with lemon on the finish. The acidity and the spine of minerals add complexity. 91. Synchromesh Riesling 2015 Four Shadows Vineyard ($19.09). This vineyard is high up on the Naramata Bench. The bracing acidity is balanced with 52 grams of residual sugar. This is a wine with intensity and weight with aromas and flavours of grapefruit, apple and pineapple. The finish is very long and seems almost dry – a tour de force of winemaking. 92. Synchromesh Riesling Storm Haven Vineyard 2015 ($30.39). This is the estate vineyard with vines that are now mature. There is a whiff of petrol, even though the wine is young. The flavours are intense – lime, lemon, grapefruit and mango – with good acidity and a spine of minerality. 92-94. Synchromesh Cachola Family Farms Cabernet Franc 2014 ($16.49). This is wine delivers lots of aroma and flavour with a juicy texture. There are notes of raspberry, cherry and spice. 90. Terravista Vineyards is the Naramata Bench encore by Bob and Senka Tennant, former owners of Black Hills Estate Winery. The Terravista portfolio is dedicated just to white wines, including two Spanish varieties, Albariño and Verdejo, from the estate vineyard, and Rhone whites from the south Okanagan. Terravista Fandango 2014 ($24.90). This is the blend of the two Spanish whites. It is a fresh and juicy wine with aromas and flavours of lemon, honeydew melon, peach and apple. The finish is long. 91. Terravista Figaro 2014 ($23.90). This is a blend of Marsanne, Roussanne and Viognier. It begins with herbal aromatics and delivers stone fruit flavours with a hint of hazelnut. The finish is dry and austerely crisp. 91. Terravista Viognier 2014 ($18.90). Crisp and firm, this wine has aromas of apricot and flavours of apricot, melon and lime, with a nice spine of minerals. 90. TH Wines opened in 2012 as Tyler Harlton Wines. It still operates from an industrial park at Summerland. Tyler, a Saskatchewan native, could be described as a polymath. He also has a law degree from McGill but has a wide range of interests from hockey to organic farming. He produces interesting wines. TH Wines Riesling 2014 ($26.99). Almost austere in its dryness, this wine delivers aromas and flavours of lime and petrol around a mineral backbone. 88. TH Wines Viognier 2014 ($24.99 but sold out). Pity this is sold out. It has classic aromas and flavours of apricots and peaches with a spine of minerals. It has a crisp and dry finish. 89. TH Wines Rosé 2015 ($22.99). This is a blend of Merlot, Cabernet Franc and Malbec. Salmon pink in hue, it has aromas and flavours of spicy cherry with a hint of red licorice. The finish is dry. 89. TH Wines Pinot Noir 2014 ($32.99). This well-made wine has aromas of strawberry. On the palate, there are flavours of strawberry and plum. The tannins are silky. 90. TH Wines Cabernet Merlot 2012 ($34.99). This is a blend of Cabernet Franc, Merlot and Malbec. It has aromas and flavours of cassis and blueberry with spice and earth on the finish. 90. Van Westen Vineyards was opened near Naramata in 2005 by Robert Van Westen, a member of a family that also grows incredible cherries. The winery is in a former fruit packing house. The tastings here are informal and friendly. All of the wines have names starting with V.
Van Westen Vino Grigio 2014 ($19.90 for 325 cases). This is Rob’s take on Pinot Gris – a crisply refreshing white with aromas and flavours of apple, pear and lemon. 90. Van Westen Vivacious 2014 ($19.90 for 524 cases). This is Pinot Blanc, usually with a dash of Pinot Gris. It begins with aromas of apples and green melon, delivering flavours of apple, pear and citrus. 90. Van Westen Viognier 2014 ($24.90 f0r 174 cases). This is a textbook Viognier, beginning with aromas of apricot. On the palate, there are flavours of apricot and orange with a not of spice and ginger on the crisp finish. 91. Van Westen Vixen 2014 ($19.90 for 73 cases). This is a spectacular late harvest wine (70% Pinot Blanc, 30% Pinot Gris) touched with botrytis. The wine begins with honeyed aromas of fruit mingling with sweet tobacco. On the palate, there are intense flavours of ripe pear and mango. The sweet finish is very well balanced with acidity, creating a finish that lasts and lasts. 92. Van Westen Vicicle 2014 ($24.90 for 200 ml; 195 cases produced). Lush and tropical, this wine has aromas and flavours of marmalade, along with a medley of flavours that include baked pear and baked apples. 88. Van Westen/Dibello Pinot Noir 2014 ($39.90 for 134 cases). This wine is a collaboration between Rob and his friend, winemaker Tom DiBello. Tom’s fingerprints are here with the fairly bold oak aromas. They mingle with strawberry and raspberry aromas and flavours. The palate is firm but evolving toward a silky texture. 89. Van Westen Violeta 2012 ($34.90 for 92 cases). This is a Malbec. Full-bodied, it has aromas of blueberry and vanilla and delivers flavours of blueberry, plum, and blackberry with spice on the finish. 91. Van Westen Vivre la Vie 2012 ($29.90 for 113 cases). This is Rob’s Merlot – a wine with a concentrated texture that frames the rich flavours of plum, black cherry and black currant. 92. Van Westen Voluptuous 2012 ($29.90 for 341 cases). One of the winery’s flagship reds, this has always been a field blend of 67% Merlot and 33% Cabernet Franc. It has aromas and flavours of cassis, plum, black olives, dark chocolate and black coffee. On the finish, there is a note of spice and sage. 92. Van Westen V 2011 ($34.90 for 426 cases). This is 49% Merlot, 24% Malbec, 21% Cabernet Franc, 4% Cabernet Sauvignon and 2% Petit Verdot. The wine is intense and complex, with aromas and flavours of black currant, black olives, dark chocolate and sage. Not yet at its peak, this is a wine that will cellar well for at least 10 years. 93. Van Westen Vulture 2012 ($39.90 for 76 cases). This is Rob’s Cabernet Franc. It begins with aromas of raspberry, black cherry and plum and delivers flavours of spice, black currant, raspberry and milk chocolate. 92. It is safe to say that winemaker Severine Pinte never has a chance to get bored. She is the winemaker from two Okanagan wineries, Le Vieux Pin (LVP) near Oliver and LaStella near Osoyoos, both owned by Enotecca Wineries and Resorts of Vancouver. The portfolios are dramatically different, as are the styles of the wines. “We want Le Vieux Pin to make wines of balance and finesse and restraint, and LaStella to make wines of lushness and exuberance and power,” says managing partner Rasoul Salehi. Severine, a French-trained winemaker who joined the Enotecca group in 2010, works with different varieties at each winery. It is the sort of creative challenge that appeals to her. The 2015 vintage was famously hot. Almost all wineries began the harvest in late August and certainly in September. The challenge was to being in grapes, which had matured to good flavours, before the acidity dropped too much. Some producers had to acidity wines, a practice not uncommon in hot regions. It was decided not to make a barrel-fermented premium Chardonnay in 2015 from the early-picked grapes because an oak-aged wine with comparatively low acidity might have been flabby. The 2014 vintage was almost as warm. Winemaker Severine had to be equally nimble to produce wines to the standard expected by consumers of LVP and LaStella. A case in point is Fortissimo, the winery’s Tuscany-inspired (because it includes Sangiovese) red. LaStella has produced this wine in every vintage since 2007. The wine is a blend primarily of Merlot and Cabernet Sauvignon, with a volume of Sangiovese that varies with the vintage. In 2014, the blend has 21% Sangiovese, the highest ever, because the variety was critical adding needed acidity to the blend. The current releases from the two wineries are an exhibition of her confident and sur-handed winemaking. LaStella Vivace 2015 ($21.99 for 1,240 cases). This is Pinot Gris but made in the light fruity style of Pinot Grigio, with just 12.8% alcohol. To preserve purity and freshness, the juice was not left in contact with the skins; nor did it sit on the lees. It has notes of lemon on the nose and on the palate and finish with crisp, tangy citrus flavours. 90. 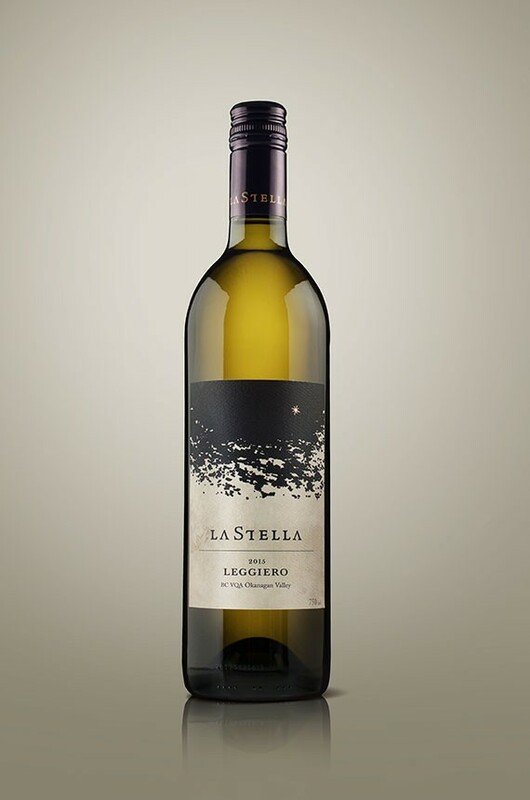 LaStella Leggiero 2015 ($21.99 for 350 cases). Although a portion of this wine was fermented in a neutral puncheon, basically this is a refreshing unoaked Chardonnay, crisp with apple flavours, and lean and dry. The alcohol here is 11.9%, the result of picking early in a hot vintage. 90. LaStella Lastellina 2015 ($20 for 715 cases). The rosé is a blend of Cabernet Franc, Merlot and Sangiovese. The hue is a vibrant pink. The wine begins with aromas of cherry and plum, leading to refreshing sour cherry flavours balanced with a touch of residual sugar that gives the wine a juicy texture. 90. LaStella Fortissimo 2014 ($29 for 1,374 cases). This is the winery’s bread and butter signature wine – a blend of 57% Merlot, 21% Sangiovese, and 11% each of Cabernet Sauvignon and Cabernet Franc. One can consider this savoury wine an Okanagan version of a super-Tuscan wine. The Sangiovese brings cherry aromas and flavours that blend with flavours of black currant, saddle leather and mocha chocolate. The tannins are long and silky. 92. LaStella Maestoso “Solo” Merlot 2013 ($89.90 for 188 cases). This wine will be released in the fall but it is already drinking well. It is a bold, rich Merlot with fruit aromas that bound from the glass and flavours that fill the mouth: plum, cassis, lingonberry and spice. 92. 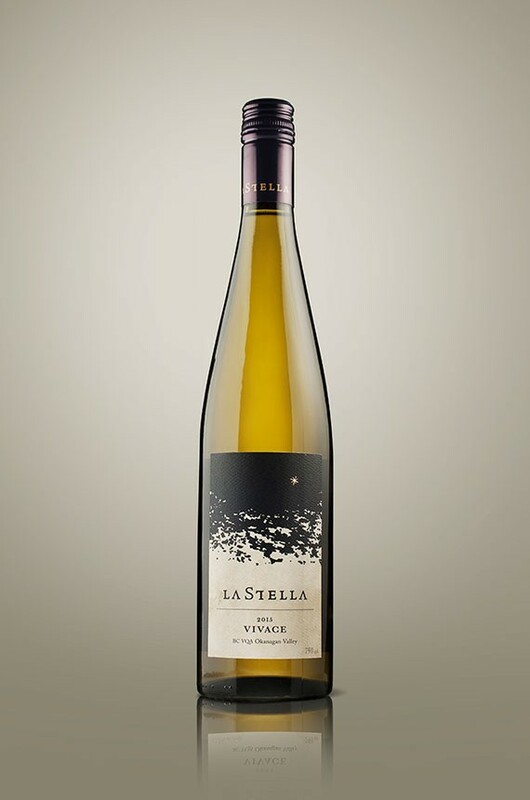 LaStella La Sophia 2013 ($79.90 for 125 cases). This is a Cabernet Sauvignon with grapes from the famed U2 block at Inkameep Vineyards. The aroma of cassis and mint candy thrusts itself from the glass. On the palate, there are complex flavours including black currant, deli spices and dark chocolate. It is an intense, big-boned wine with 15.1% alcohol, a structure that portends very good aging. 94. Le Vieux Pin Sauvignon Blanc 2015 ($29.90 for 416 cases). Here is a white that is a match for fine Sancerre. It begins briskly with aromas of lime and herbs and continues just as briskly on the palate with flavours of lime, pink grapefruit and guava. The finish is crisp and refreshing. 91. 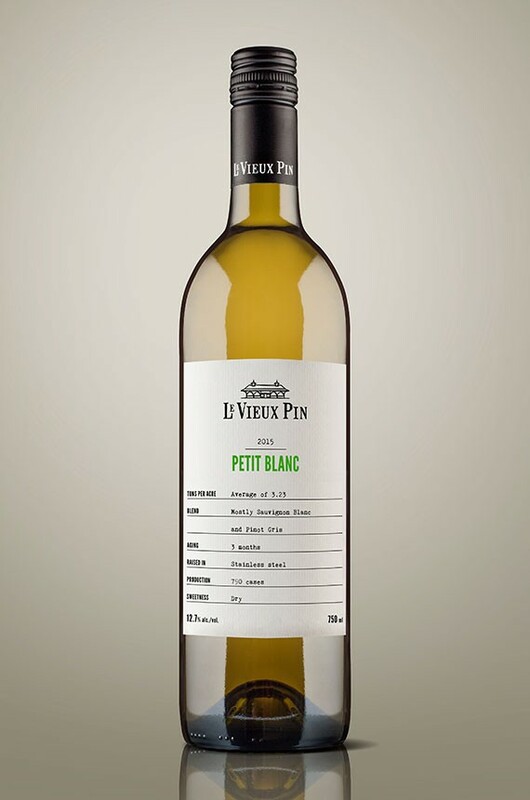 Le Vieux Pin Petit Blanc 2015 ($18.50 for 790 cases). This is the winery’s entry level dry white, a blend of Sauvignon Blanc, Muscat and Viognier. It has flavours of melons and apples with a savoury herbal note on the finish. 90. 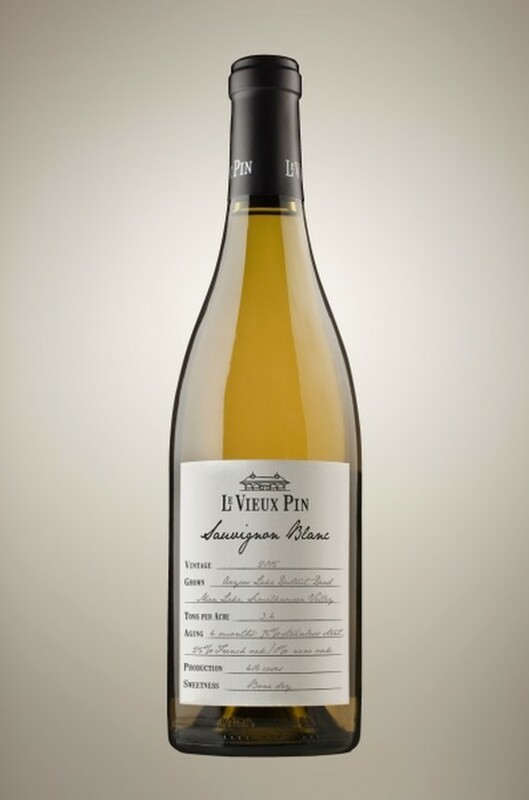 Le Vieux Pin Roussanne 2014 ($29.90 for 50 cases). This is the first time that LVP has release a single variety Roussanne. It is an exceptionally complex white with aromas of herbs and tea. On the palate, there, the herbal notes are entwined with flavours of pear, hazelnuts, toasted cereal grain. The wine is dry, with good weight on the palate. The wine is sold almost exclusively to members of the wine club. 91. Le Vieux Pin Vaïla 2015 ($21.99 for 780 cases). 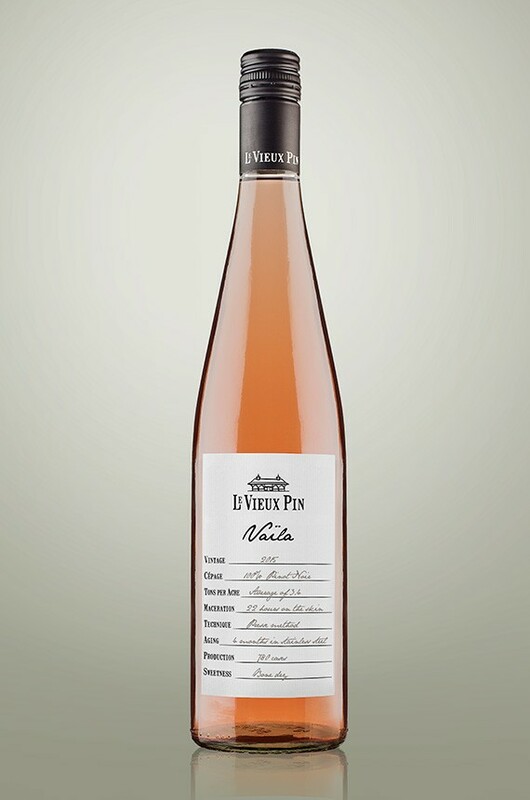 Made entirely with Pinot Noir, this rosé wine’s appeal begins with a vibrant hue. It has aromas and flavours of cherry and strawberry and has a zesty, dry finish. 90. 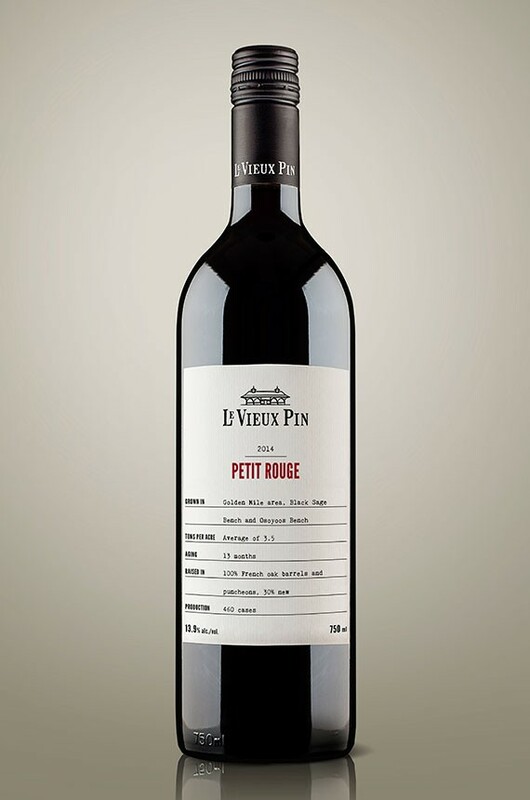 Le Vieux Pin Petit Rouge 2014 ($21.99 for 460 cases). This is a blend of Merlot and Cabernet Sauvignon with a small percentage of Syrah. The wine has been barrel-aged (30% new) for 15 months. The wine begins with aromas of black currant and cherry. It has flavours of black currant, blackberry and hits of espresso coffee. 88. Le Vieux Pin Syrah Cuvée Violette 2014 ($26.99 for 850 cases). Dark in colour, this wine begins with the classic note of black pepper on the nose. It has flavours of fig, plum, black olives, dark chocolate with a savoury, earthy note on the finish. 91. 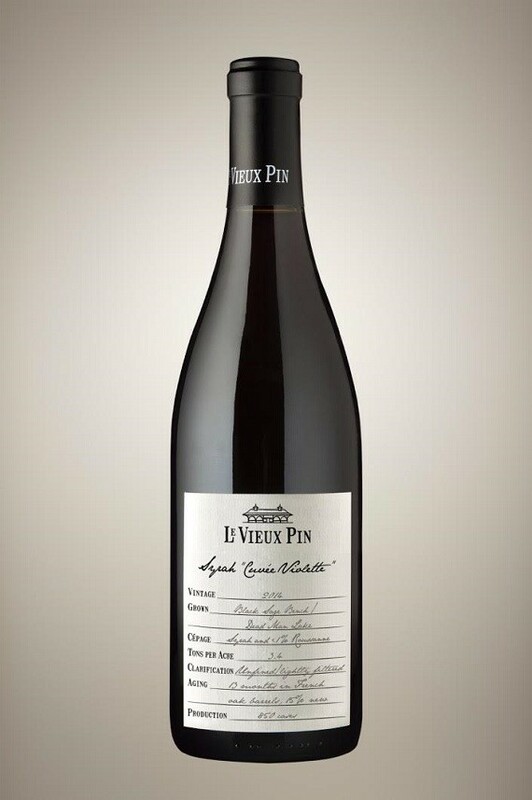 Le Vieux Pin Equinoxe Syrah 2013 ($79.99 for 267 cases). This wine was aged in barrel, but with no new oak to ensure nothing obscures the rich fruit flavours of fig and plum. The texture is concentrated. The wine will be released this fall; it is still developing in bottle. 92. 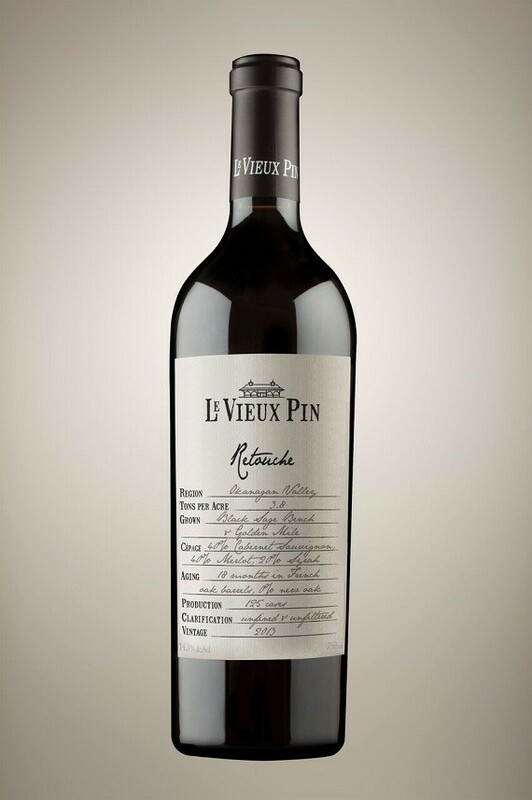 Le Vieux Pin Retouche 2013 ($59.99 for 125 cases). This is 40% Cabernet Sauvignon, 40% Merlot and 20% Syrah; aged 18 months in French oak (none new). The wine is sold just to LVP’s wine club and a handful of restaurants. It is a dense, concentrated wine with aromas of cassis and flavours of black currant, coffee and dark chocolate.